The Bottom Line: Expect more warm temperatures and sun. Avalanches are possible in isolated and extreme terrain. If you are heading to upper elevations or less traveled terrain, take time to assess the snow. While there aren't any major problems, avalanches are not impossible. You could trigger isolated loose wet avalanches in extreme, rocky terrain or areas of shallow snow. The lower elevation snowpack continues to creep and glide with recent rain and warm temperatures. 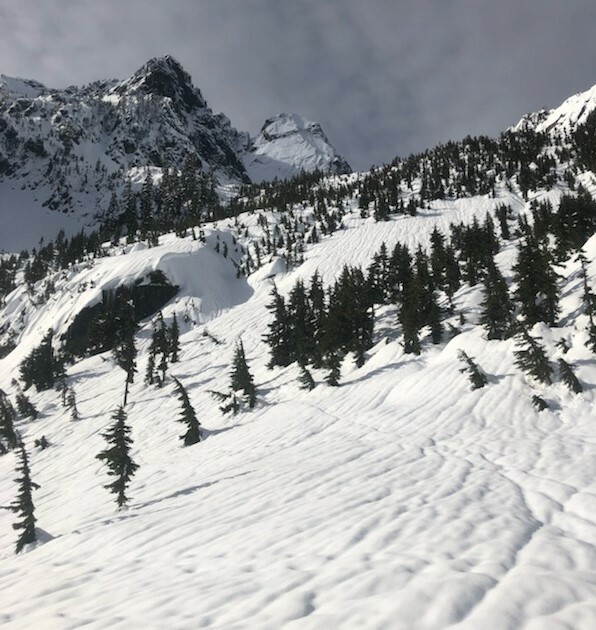 While no glide avalanches have been reported, you may see crevasse like features on some slopes. Also, cornices commonly fall with prolonged warming. Limit your exposure and avoiding traveling on or below these features. Monday will be another day of warm temperatures and sun. You may still find soft, wet snow on steep sunny slopes. If you sink to the top of your boots on slopes with wet snow, it's time to move to more shaded, supportive snow. Most loose wet avalanches you will see are at least a few days old or from a rain event on the 23rd. A number of factors will help keep snow surfaces slightly more frozen on Monday. Air temperatures should drop a bit and an easterly wind will cool the surface snow. Check out the Regional Synopsis for details of recent avalanches and conditions.